What sort of future for the Democratic People’s Republic of Korea? When I was in the Democratic People’s Republic of Korea (DPRK) at the end of last year (2017) the international situation was very different from what it is now – at least on the surface. So many negotiations go on in the background that the rhetoric of leaders has to be taken with a sizeable pinch of salt. Unfortunately the world-wide capitalist media concentrates on such outlandish statements and in the process present a picture that confuses rather than informs. What will come out of the meeting on June 12th 2018 between the DPRK leader Kim Jong-un and the US President Trump remains to be seen but it might be worth while reminding people of the historical background to these talks and the complex international situation that will follow whatever happens in Singapore. That relatively short war caused millions of deaths and untold destruction on the Korean peninsula. As in the Vietnam War – another war of aggression promoted by the US and its sycophantic allies – the main reason the struggle didn’t end in ignominious defeat for the United Nations’ forces was due to the overwhelming superiority the US had in air power. Again as history is often forgotten in these circumstances, its worth remembering that the war broke out less than a year after Chairman Mao’s Declaration of the People’s Republic of China (after almost 20 years of warfare) and only five years after the end of the Second World War – known by the Soviet People as the Great Patriotic War – where the USSR had suffered unbelievable losses, both in people and material. If the US wanted to achieve its aims then there was no better time to attempt to gain control of the Korean Peninsula. They failed. One of the true facts that have been widely disseminated in the last few months when it comes to Korea Is the fact that the war didn’t end with a treaty but with an armistice. That armistice was signed in a rapidly constructed hut just outside one of the command bunkers in the virtually razed to the ground city of Pyongyang, in the DPRK. In politics the location of the signing of such agreements is important and making the UN commanders come to the North to agree that they would cease hostilities says a lot. But all imperialisms don’t like losing and after the armistice and the end of open hostilities they set about given the maximum support to the fascist regime in Seoul and have maintained an aggressive and threatening stance against the DPRK ever since. If we look at the DPRK we see that although the aggressive rhetoric increased throughout 2017, and the first few months of 2018, the situation has been on a knife-edge ever since the end of the Geneva Conference in June 1954. The openly fascist government of Syngman Rhee, supported by the Americans after the end of hostilities, was more than happy to accept the permanent placement of foreign soldiers on South Korean soil – local security forces could suppress any opposition from the people whilst the border along the Demilitarised Zone would be patrolled by US forces. This presence has not diminished in the more than 50 years since the fighting stopped and now there are something like 30,000 US troops in various parts of South Korea – most close to the border, the Demilitarised Zone (DMZ). Most people just lap up the pap that’s fed to them by the various media in their respective countries when reference is made to the development of nuclear weapons and ballistic missiles in the DPRK. They see it as an aggressive and belligerent stance by a ‘desperate and unstable dictatorship’ – the sort of descriptions used by their ‘democratic’ leaders. However, how many of them will know that it was the Americans, not satisfied with the number of conventional weapons that they had in South Korea, were the ones to break the Armistice Agreement by first introducing nuclear weapons into the Korean Peninsula in January 1958? There was a partial withdrawal of these weapons in October 1991, when the US administration of George Bush decided to remove all land based nuclear weapons. However at the same time weapons which could be deployed from aircraft, from air bases in South Korea, were excluded. And, anyway, the fact that the US nuclear arsenal is so huge, and distributed throughout the world in a manner unique to any other country, this means that the nuclear threat is only slightly mitigated – aircraft or submarines, based in other submissive countries close by, could be close to the DPRK within a matter of hours. So that’s now 50 years when the people of the DPRK have been under threat of nuclear annihilation from the most powerful (militarily) country on the planet – and this doesn’t even take into account the massive ‘war games’ that take place a couple of times each year, on land, sea and in the air right next to the border. Although classified as exercises these are obviously no more than acts of intimidation, the classic tactic of a bully which the US has assumed with even more openness since the (temporary) weakening of Russia when the people accepted the full-scale restoration of capitalism in their country. If the American workers who have supported (and still support) Trump had half a brain between them they might start to question why, even in times of ‘austerity’, there is always money made to feed into the bottomless maw of the military-industrial complex. No other country in the world has to experience this implied military threat on a regular and ongoing basis. For decades. And not knowing if or when the exercise might turn into a full-scale military attack. It’s the hypocrisy of the west that is astounding in these situations. Those in Britain only have to think back to October 2016 when a small Russian naval fleet passed through (in international waters) the ‘English’ Channel. It was treated in some quarters as tantamount to a threat to the security of the country but when huge war games are taking place on the border of another sovereign country it’s OK if they are carried out by the US and its allies. Added to this (up to a couple of months ago) for the best part of a year, with Trump trying to establish his credentials as a ‘hard man’, the world has had to listen to the threats of the bully in the White House declare that the DPRK should expect ‘fire and fury’ if it does not abide by the wishes of the US; that the country ‘would regret it fast’ if it carries along its chosen path; going as far as to state, earlier in 2018 that the region was close to war. Faced with all this what is the DPRK to do? Back down and then suffer the humiliation that all bullies shower on their victims or stand up and face the aggression with dignity? Their development, therefore, of a nuclear capability makes sense in the face of such continued hostility. Their level of technological expertise has long been known, and they have successfully launched satellites in Earth orbit – something the British have been unable to do alone. The capitalist countries argue that the DPRK shouldn’t have the right to develop and possess nuclear weapons. They argue about non-proliferation treaties and try to force such a stance on all nations, especially ones that are prepared to stand up and refuse to do what they are told. But at the same time the major nuclear powers openly develop and improve their nuclear stocks (with the UK and the renewal of Trident and with Trump’s recent statements about a similar upgrade of the massive stocks the US already holds) which goes in direct contravention of the same non-proliferation treaties they so espouse. Trump is going to the meeting on the 12th June claiming the only reason such a meeting has been possible is due to his own hard line. 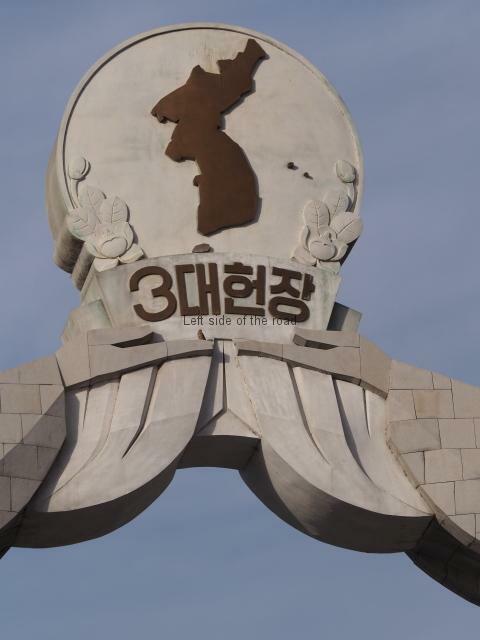 Like many others he forgets history and doesn’t seem to accept that there has long been desire within the south of the peninsula for an easing of tensions – which have been exacerbated by the attitude of various United States administrations in the past. The US might also underestimate that there’s a growing feeling in the south that being virtually occupied by a foreign power, who not only lives in your country but carries out actions that might – one day – lead to a devastating civil war, has gone passed its sell by date. Although there are US bases in Japan and have been there since the end of the Second World War they don’t play the same aggressive role as they are, and have been, in South Korea. The US President also has already declared that he will not accept anything less than total submission from the DPRK on the matter of de-nuclearisation – a somewhat strange negotiating stance but not a surprise taking into account the individual concerned. That would be a hard one for Kim Jong-un to sell back home as there was definitely a sense of pride from the few people I had the opportunity to talk to during my short visit to the country. If nothing else the people in the DPRK have, and value, their independence. Relying on the goodwill of a President who continually reneges on past agreements could be a bit dodgy – whatever the assurances. In a sense the DPRK has little to lose in these ‘negotiations’. Obviously sanctions hurt – even more when they are enforced by the erstwhile friend of the People’s Republic of China. China signing up to the most recent round of sanctions hurt, not just economically but also as the Chinese People’s Volunteers had played such a fraternal role during the Fatherland Liberation War. In Dandong, at the Chinese end of the Friendship Bridge across the Yalu River in the north-west of the DPRK, there are a couple of monuments celebrating the sacrifice of the people of China who went to fight on the side of their comrades in North Korea. If Trump doesn’t get what he wants then as far as the US goes the situation hasn’t changed. He might ramp up the rhetoric to the same level as the end of last year but unless he can prove that Kim has been totally unreasonable this will give both China and Russia a get out clause in the continued imposition of sanctions. International politics are getting even more complicated at the moment with allies bring pushed away, as was seen in the G7 summit that has just finished in Canada. China and Russia have been getting closer in certain economic and military fields and if the US is not careful they might find that they are the ones who are being isolated internationally. The US is not the power it once was and even though Russia isn’t in the same situation as it once was as the revisionist and renegade country to Socialism during its latter days as the USSR it is not the sick man it was even ten years ago. And China’s economy is such a threat to the US that trade wars are very much on the cards. American arrogance, which is merely being personified by its present President, might lead to the country’s comeuppance. Empires fall when their leaders, and possibly many of their population, think they are invincible. The consequences of the meeting in Singapore might be different from Trump might think – whether he is smiling when he gets back on Air Force One or not.